Bellflowers, known botanically as Campanulas, are a large group of cool climate perennials. Depending on the variety, they may be used in perennial borders, as a small scale groundcover, or naturalized in woodland settings. Bellflowers are very cold hardy and do best in areas where summers are not too sweltering. As the name would suggest, they typically have bell-shaped flowers, usually in bluish tones, and nondescript lance-shaped leaves, though there is a surprising diversity of form among the different varieties. Most prefer to grow in full sun, although all appreciate light shade at the southern end of their range. Rich, moist soil is the key to growing bellflowers successfully. Early summer is the primary blooming period, but with a bit of deadheading they often bloom sporadically throughout summer and into early fall. Groundcover forms of bellflower look great cascading over a low stone wall, spilling out of a hanging basket or used as edging in front of a bed of taller perennials. Dalmation bellflower - (Campanula portenschlagiana) is one of the smallest species, growing only four to six inches tall and spreading widely, with upward-facing blue or purple blossoms and fine, dark green foliage. Serbian bellflower - (Campanula poscharskyana) is similar but grows as a groundcover up to one foot tall. Fairies' thimbles bellflower - (Campanula cochleariifolia) has nodding white, blue or purple blossoms that rise on delicate stalks above a low mat of foliage. 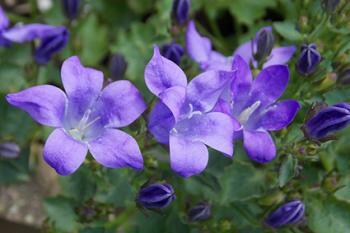 Growing, anywhere from two to five feet in height, these bellflowers grow as small clumps. 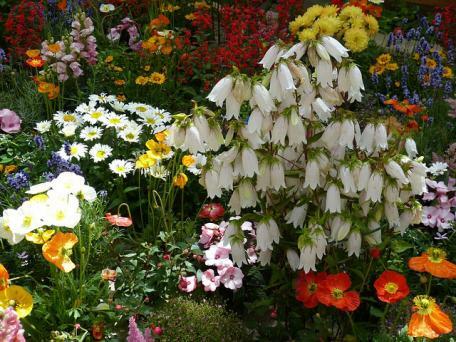 They are taller than they are wide and are a good choice for mixing into a perennial border. Peachleaf bellflower - (Campanula persicafolia) has one-inch bell-shaped blossoms that face straight out from 30-inch stalks rising above a low clump of foliage. Blue, pink, white and purple forms are available. Milky bellflower - (Campanula lactiflora) grows up to five feet tall with bell-shaped, indigo-colored blossoms that stick straight up from the end of the stalks. Spotted bellflower - (Campanula punctuata) is known for its larger blossoms which nod downwards from the top of two-foot stalks. They come in pink, purple and blue forms. There are a few bellflowers that don't fit neatly into typical classifications. The three varieties below are some of the most heat tolerant bellflowers and do well in filtered shade. Korean bellflower - (Campanula takesimana) grows as a tall groundcover, two to three feet in height with three to four-inch blossoms and heart-shaped leaves. Pink Octopus is an unusual cultivar with spidery pinkish-red flowers on 10-inch stalks. It spreads via underground runners and is useful for naturalizing in dry shade gardens. Clustered bellflower - (Campanula glomerata) grows about two feet tall, bears the classic blue bellflowers on erect stalks and needs constant moisture to thrive. 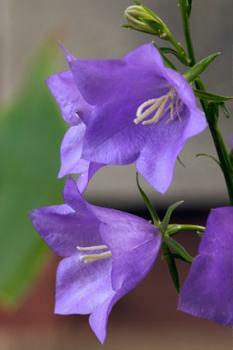 Bellflowers are best planted in either early fall or spring. You can usually find them in local garden centers that are located in climates where bellflowers grow best. However, you will find your best selection through a seed catalog. Fortunately, most are easily grown from seed. Sow seed indoor in early spring and transplant when the seedlings are six to eight weeks old. Besides removing the spent flower stalks to encourage repeat blooming, bellflowers are fairly low-maintenance plants. The clumps can be divided every few years to keep them healthy, which is also a great way to provide new plants. 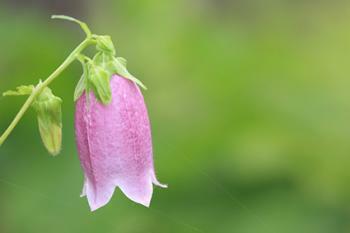 Bellflowers are prone to most of the typical garden pests, like slugs, mites and aphids, but not especially so. If these get out of control, garden centers are full of products to combat them - diatomaceous earth for slugs and insecticidal soaps for mites and aphids are two of the top non-toxic products available. The most common problem gardeners experience with bellflowers is that they grow too well and take over areas where they are not wanted. Most will spread by seed, which is a desirable trait when they are planted in a naturalized environment, but it becomes a problem in small, highly managed flowerbeds. The groundcovers spread by underground rhizomes and can slowly colonize an area where growing conditions are ideal, Korean bellflower being most notorious for this trait. The groundcovers can be difficult to remove where they are not wanted, but on the whole, bellflowers are not a plant that is considered highly invasive in the sense that they invade natural areas. Bellflowers don't get as much attention as many other perennial species, but they have a lot to offer. With so many forms and colors to choose from, they fill a garden designers palette with a rich array of options.